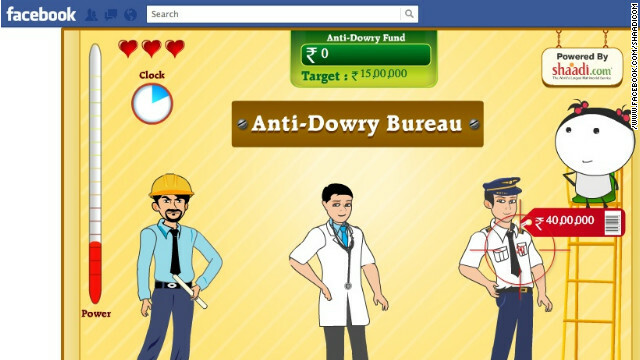 A screen grab of the game "Angry Brides," which aims to bring awareness to the violence dowries cause in India. There's a new game hoping to make a splash in the Facebook game market, and it's called "Angry Brides." No, you don't have to read that sentence again; we didn't accidentally misspell the game you're thinking of. But the people behind this game hope the mix-up gives momentum to "Angry Brides," which aims to put a spotlight on the issue of dowries in India. Dowries are traditionally given to a groom's family to ensure the bride is taken care of and can, in some cases, cause violent clashes between families. The gifts can include money, jewelry or any other family belongings. The game, produced by the Indian marriage site Shaadi.com, is a play on the extremely popular game "Angry Birds." But instead of hurling birds across the screen, this time, you're throwing household objects such as shoes and rolling pins at prospective grooms, with listed dowries starting at 1.5 million rupees (about $29,200). If you hit grooms just right, you'll lower the amount and add it into your anti-dowry fund. "The Angry Brides game is our way of throwing a spotlight on the nuisance of dowry," Ram Bhamidi, senior vice president and head of online marketing for the site, wrote on its Facebook page. The page, advertising the game, features what appears to be a Hindu goddess holding all of the tools you would need to strike your possible groom. "A woman will give you strength, care and all the love you need ... NOT dowry!" a caption under the image exclaims. The group hopes that the viral nature of "Angry Birds" - and therefore, they hope, the parody - will draw attention to the dowry issue and the violence it can cause. "According to a 2007 study ... there is a dowry-related death every four hours in India," Bhamidi wrote on the Facebook page. "We condemn this menace and have consistently run campaigns on social media to help create awareness of the issue." Very happy to meet you have to blog, very great, was a great help to me, the fine blog, very good information, is very reality. I feel good article should let more people share together is right, I will always support you.